The first series of books in the Diamond Books Bible based reading project is ‘The Creation Series’. This series consists of 8 books and is intended to be read to 3-4 year olds. 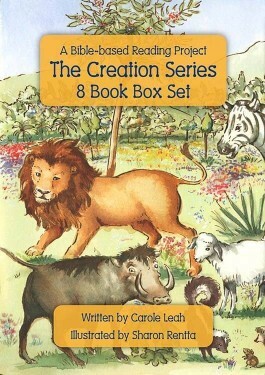 The Creation series has been written from a Christian viewpoint and prepares children to read and extend their vocabulary. Through these books children can develop and practise preparatory skills for reading as well as see the wonder of God’s order in creation. Throughout the Creation Series, readers are briefly introduced to characters who will feature throughout the Diamond Books reading project, Todd, and his dad and mum, and Joy and Daniel, and their dad and mum. Todd is a friend of Joy and Daniel. Daniel and Joy are brother and sister. The Creation Series has been written by Carole Leah and each book is beautifully illustrated throughout with full colour illustrations by Sharon Rentta. Exciting series presenting God as Creator. So refreshing to see books like these. Good quality illustrations in an attractive contemporary style. Great to have in a strong presentation box. Really good for families, Sunday Schools, Church Schools and Home Education. 3 and 4 year olds in particular will love them! Thank you.